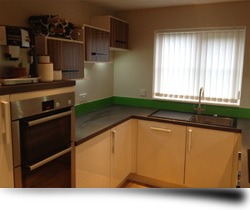 We offer a bespoke glass splashback fitting service. Estimates for your glass splashbacks are produced by our skilled estimators from your drawings or templates and we strive to get your estimate as accurate as we possibly can to avoid any discrepancies in costs further down the road. Once you are completely happy with the estimate, we take a 50% deposit before coming to your property to complete the full survey. Please note that after the intial site survey we will check all the details and re quote if there is found to be a major difference. We will usually carry out our site Surveys within 5 days of recieving your order or deposit. Splashbacks of Distinction make templates for each and every panel of glass, this process helps to eliminate measuring and manufacturing errors in the finished product. Splashbacks of Distinction supply and offer a fitting service for bespoke kitchen splashbacks, worktops, shower cubicles and other lifestyle uses such as television backing glass plates, and all to your specific requirements. All of our work comes with a 10 year guarantee for your added piece of mind. Our professional fitters can show you a sample box at the time of survey with many colours and finishes to choose from. Glass splashbacks are our business, it's simply what we do, therefore once your design is ready for fitting and installation you need look no further than Splashbacks of Distinction. By using our glass fitting service you can sit back and relax, safe in the knowledge that your splashback or worktop will be in the very best hands with our highly skilled and experienced team. We want our customers to get the most out of their investment and believe correct installation ensures the longevity of this superior, quality product. We would advise that this work is always carried out by experienced professionals and that's where we come in. We ensure the quality of your item will not be compromised and with the correct installation you will enjoy the beauty of a new splashback for years to come.